Loneliness is an issue that impacts many of us, regardless of our age or circumstance. And all those that know the pain that this can cause will be able to sympathise with anyone who is currently experiencing it. Loneliness is particularly prevalent in the older community, where numerous research has found that older people struggle to cope with the issue. In the UK is has been found that more than 2 million people over 75 live alone in England and that more than a million older people go more than a month without speaking to friends, neighbours, and family members. After spouses pass away or when family members move to different areas of the country, loneliness can have a nasty way of taking hold and without the tools to combat it, it can end up making the latter years of life particularly unpleasant. Another factor that doesn’t help the situation, is friends and family members not seeing the signs of loneliness in their loved ones or knowing how best to help them. There are, however, are a number of things that can be done to help those that are dealing with loneliness in older age. Considering the prevalence of the issue, Monarch Mobility have decided to create a helpful infographic about how to avoid loneliness in older age. 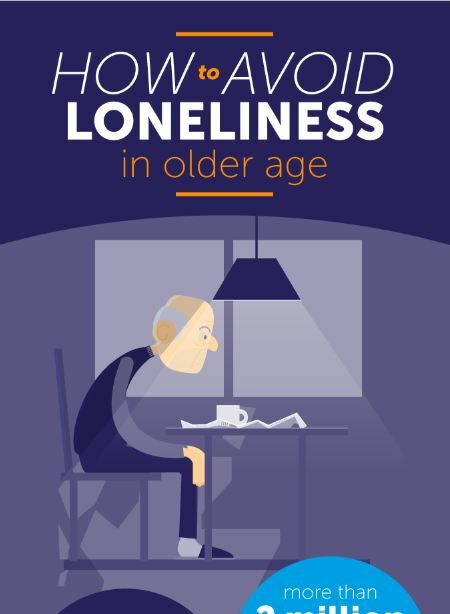 The graphic contains stats regarding the topic, and advice for how those affected, and others around them, can help prevent loneliness in older age. By following this advice and spreading awareness of the issue in our local communities, hopefully we can help prevent the onset of loneliness as much as possible.